Munich In the spirit of Mardi Gras, we’ll walk a different path today as we pass through the Munich, Germany airport and share a behind the scenes impression of something very different called Meow Wolf. The backstory involves several artists who began forming an art collective in 2008 to try something special. 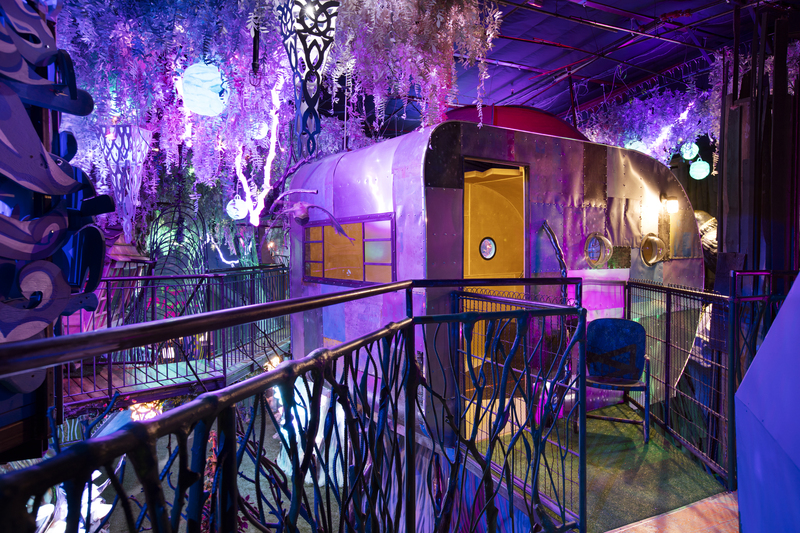 They enlisted the support of Game of Thrones author and creator, George R. R. Martin, who bought an unused bowling alley to house their imaginative installations in Santa Fe, which he now rents to Meow Wolf. After our recent board meeting for Labor Neighbor Research & Training Center and the Santa Fe Film Festival, thanks to a friend we managed to finagle a back-stage tour of many of the installations in Meow Wolf, despite the fact that the site was temporarily closed in preparation for a star turn by internet sensation, Poppy, coming this week. How do I describe this venue and enterprise? Not easily. In their words, “Meow Wolf creates immersive, interactive experiences to transport audiences of all ages into fantastic realms of story and exploration…where guests discover a multidimensional mystery house with secret passages, portals to magical worlds, climbing apparatus, and surreal, maximalist & mesmerizing art exhibits along with a children’s learning center, top ten in the U.S. music venue and cafe area.” As I said, Meow Wolf was closed, so in all fairness, I have to take their word for it, because all of the bells and whistles were turned off, but to say the least it was still impressive and clearly spoke to vivid and colorful imaginations. One of our group said he often brought his grandchildren to the site, and they loved it. Another of our group had been prodded by her daughter that this was a “must see” attraction now in Santa Fe. It is very creative and idiosyncratic, speaking to a special vision. I was impressed that there is still the structure of an art collective running the operation. They are ambitious with plans in the next two years to add similar installations in Denver and Las Vegas. They have raised millions from investors to support their expansion plans, and, importantly for the collective, they are building the installations in New Mexico in order to support their collective with something close to full-time work. They want to be the next Disney, and for all I know maybe that’s possible. I was reminded of the Music Box in New Orleans, and as we talked among ourselves of how special this would be in the city, we asked the prices for entry when the site was open. Our guide explained that it was $16 for instate residents and $22 for out of state, with the prices reflecting the fact that they now had more live music and needed to pay the musicians. Fair enough. This is a collective and much of the work in building the current success came from volunteer work by hundreds, so now they are trying to make it pay. I get it. At the same time, even as they trumpet their commitment to the community, there is an inherent tension involved. Their website says, “Company ethos embraces the reality that accomplished artists must be compensated on an equal level with other highly-skilled, in-demand professionals and that successful businesses must give back energetically to their communities, both in terms of financial assistance as well as expertise and other forms of active support.” It’s a tough balance to achieve, and perhaps only possible in cities on the rise with heavy tourism dollars to spend, rather than a place like New Orleans. These are makers, so they may “find a way,” but we don’t need another Disney, we need art collectives that are peoples’ projects and are perfectly aligned with diverse communities where real people live and want to imagine. Here’s hoping that Meow Woff can be as imaginative and creative in this area as well. This entry was posted in Ideas and Issues and tagged Art Collective, Meow Wolf, Santa Fe by Wade. Bookmark the permalink.